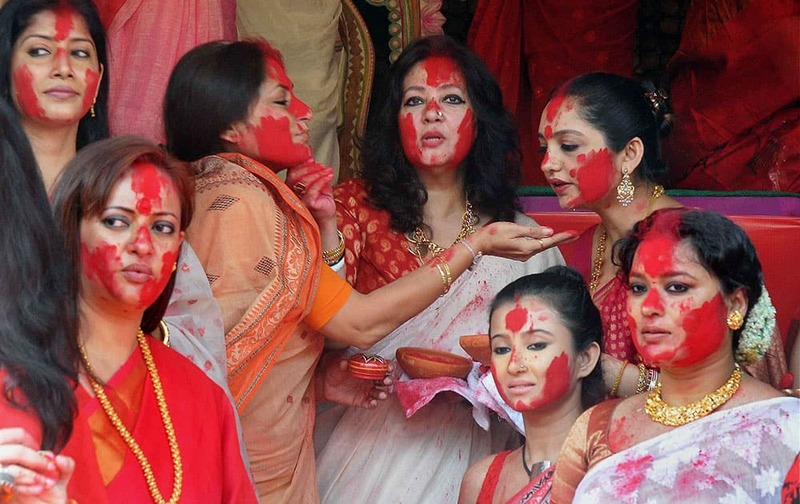 Bengali film actress & Trinamool Congress MP Moon Moon Sen(C) participate in Sindur Khela with film actress & BJP leader Rupa Ganguly and others during Vijaya Dashami celebrations, at Chalta Bagan Sarbojanin in Kolkata. MotoGP rider Dani Pedrosa, left, of Spain and Valentino Rossi, right, of Italy spray champagne on an usherette during the awards ceremony of Malaysian Motorcycle Grand Prix in Sepang, Malaysia. 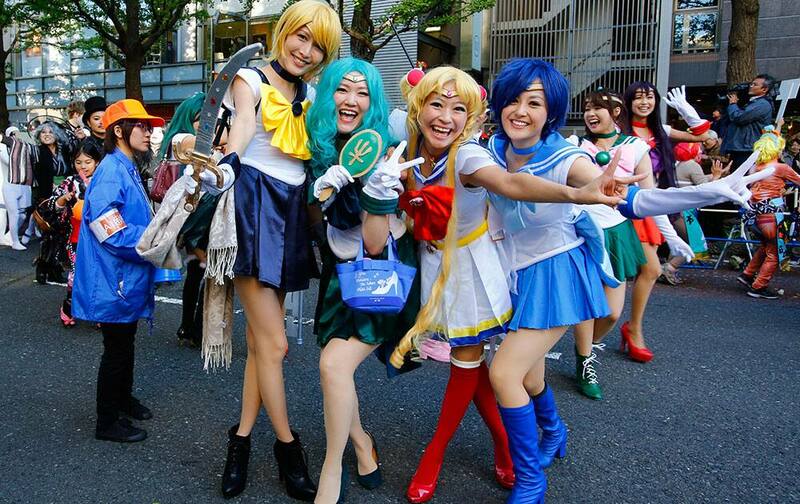 Participants in a Halloween parade pose for a photo in Kawasaki, near Tokyo. 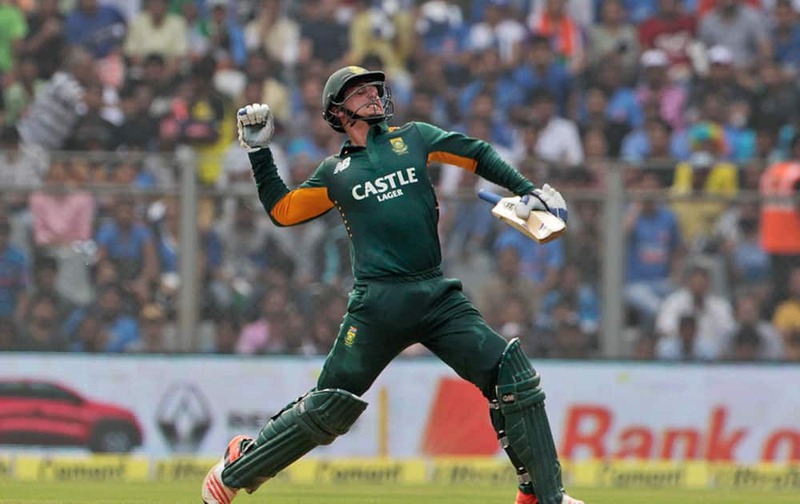 South Africa’s Quinton de Kock celebrates his hundred runs during the final one-day international cricket match of a five-game series against India in Mumbai, India. 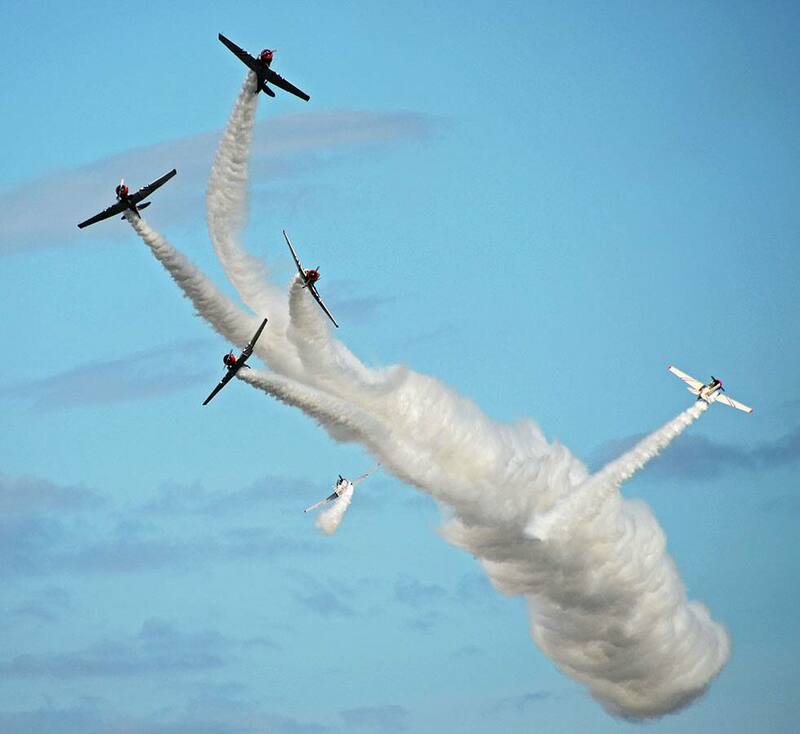 The GEICO Skytypers Airshow Team breaks formation in their six vintage WWII era U.S. Navy SNJ-2 trainers during the 2015 Jacksonville Sea & Sky Spectacular air show at Jacksonville Beach, Fla. 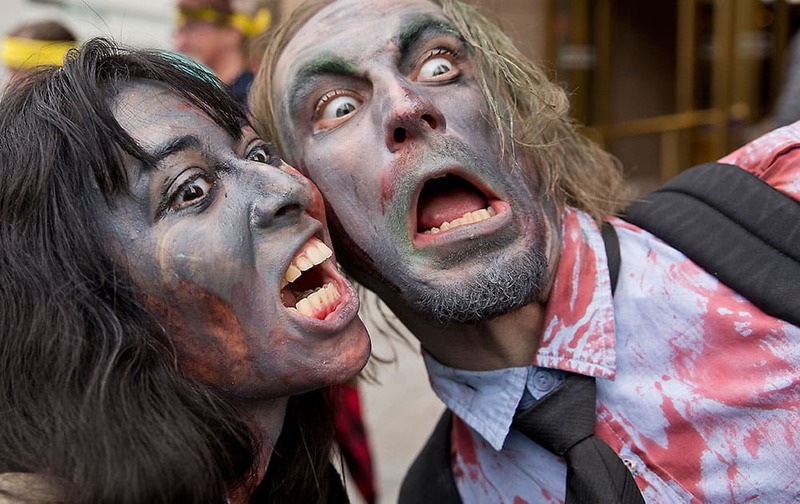 Dressed as zombies Jessica Hernandez, left, and Derek Rooney prepare for the start of the city's 10th annual "Zombie March" in front of South Station in Boston. 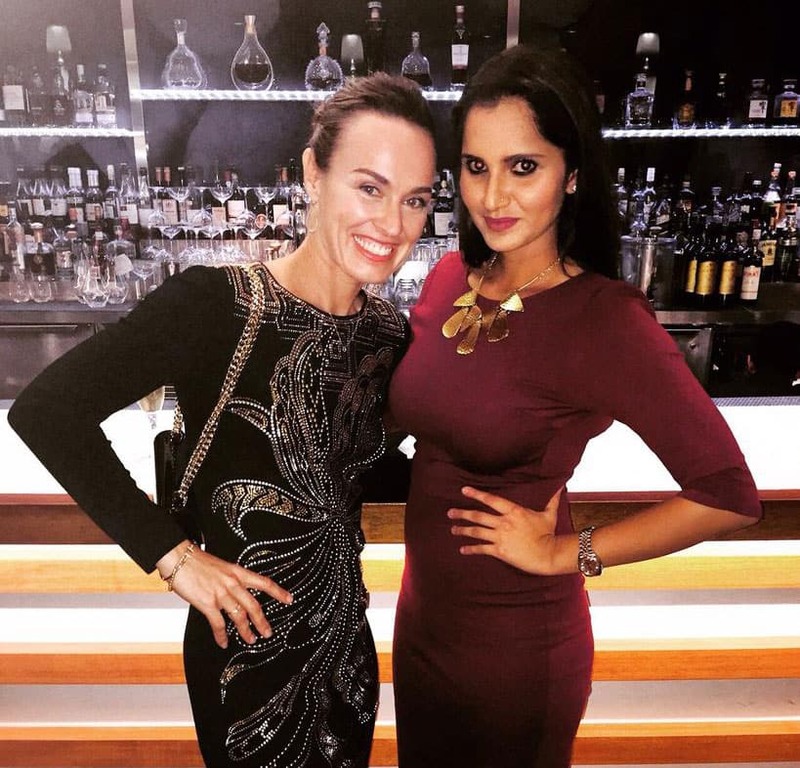 Wrestler Mahabali Shera (L), woman wrestler Rebel and Ethan Carter III (R) pose during a press conference to announce the partenership of Sports Chanel Sony Six and TNA wrestling to host the 1st ever Live International televised wrestling event in Bengaluru. 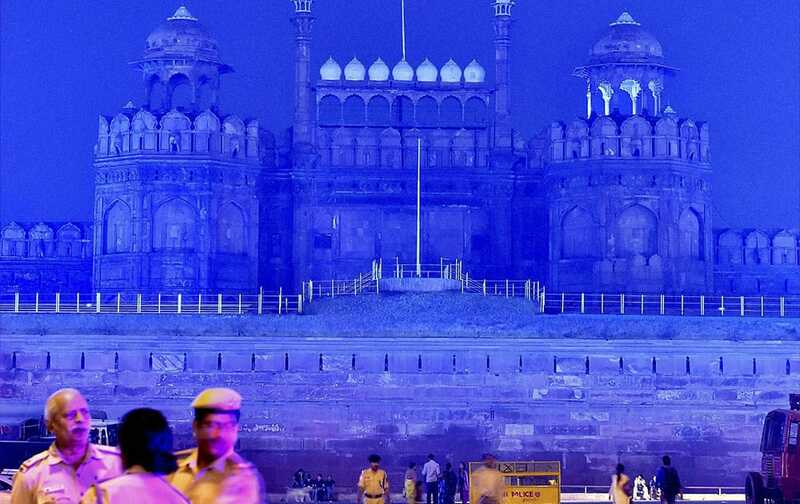 Red Fort lit by blue light to commemorate the 70th anniversary of the United Nations in New Delhi. 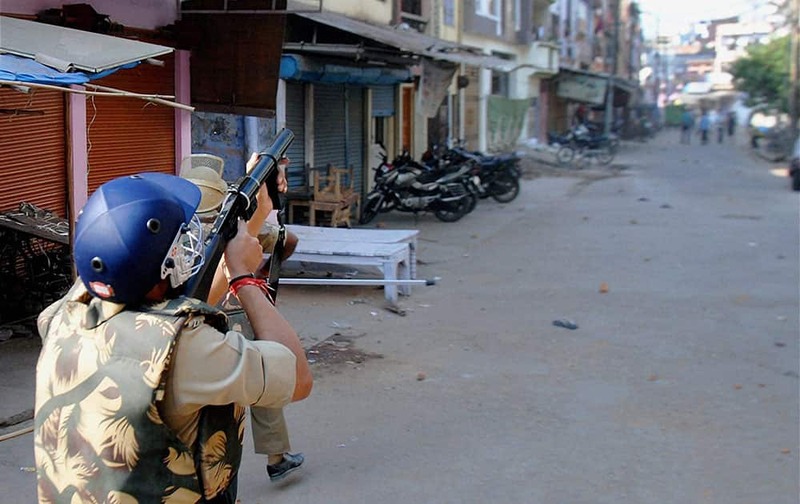 A police man fires teargas shell to control people after clashes during a Muharram procession in Kanpur. 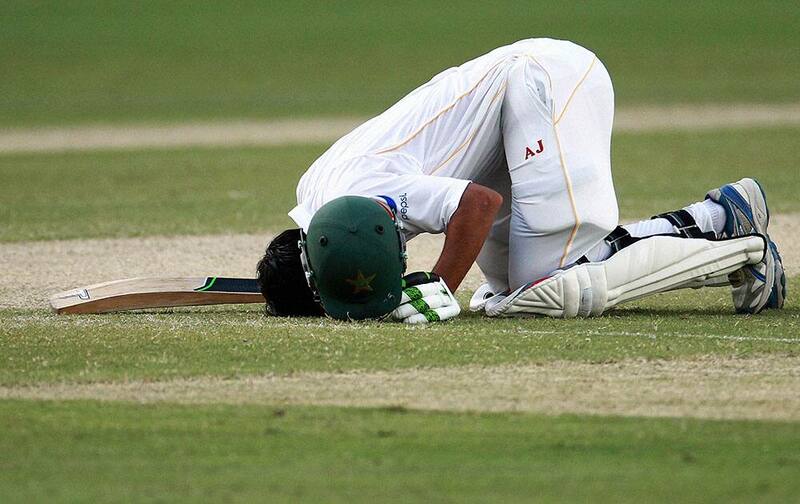 Pakistan batsman Younis Khan celebrates his 9000th runs in test cricket during the Pakistan and England Test match at the Dubai International Stadium in Dubai. 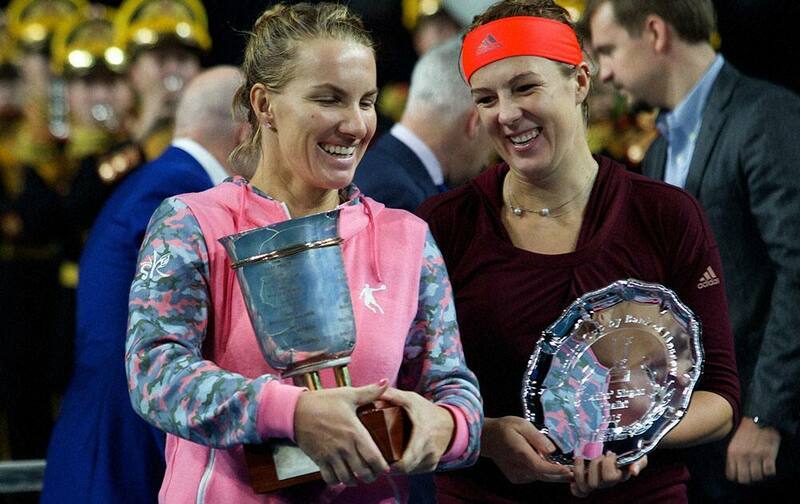 Russias Svetlana Kuznetsova, left, and Anastasia Pavlyuchenkova pose with their trophies in Moscow. 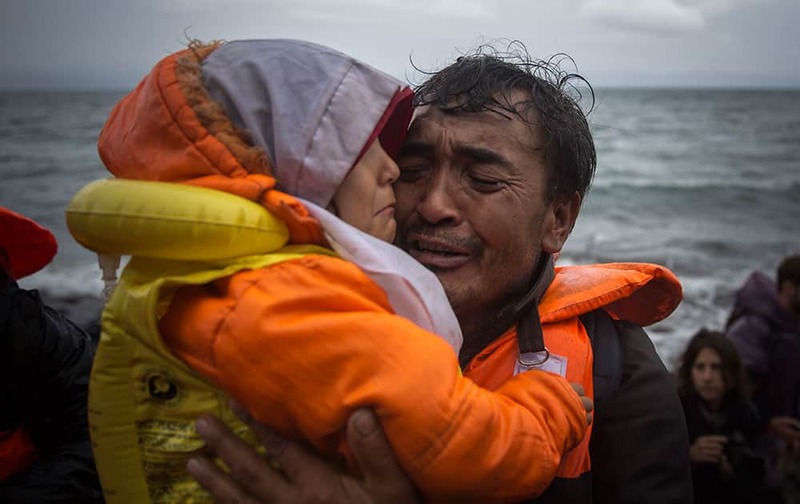 A man hugs a child on a beach after arriving with other migrants and refugees in a dinghy from the Turkish coast to the Skala Sikaminias village on the northeastern Greek island of Lesbos. 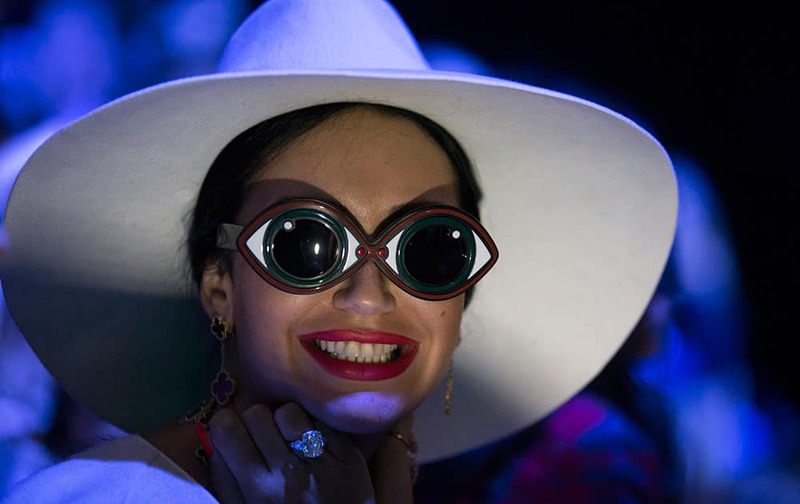 A spectator smiles while watching a model display a creation by Turkish designer Tarik Ediz during Fashion Week in Moscow, Russia. 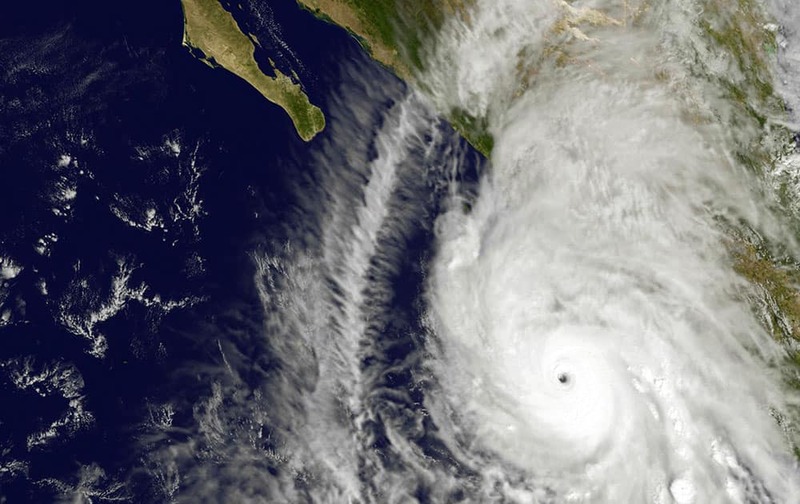 This satellite image taken at 1:45 p.m. EDT on Friday, Oct. 23, 2015, and released by NASA, shows the eastern quadrant and pinhole eye of Hurricane Patricia moving towards southwestern Mexico. The Category 5 storm is strongest ever in the Western Hemisphere, according to forecasters. 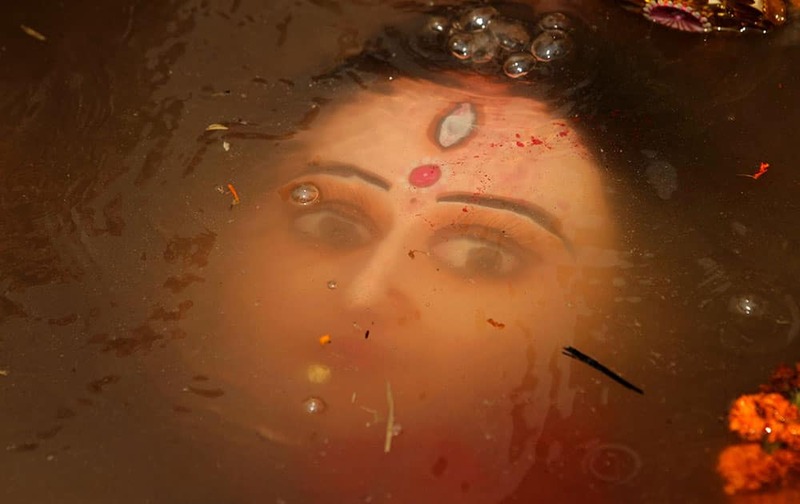 An idol of Hindu goddess Durga floats in water as devotees immerse the same in the River Kuakhai after the Durga Puja festival in Bhubaneswar, India. Meek Mill and Nicki Minaj kiss after their performance at the Power 99 POWERHOUSE 2015 at the Wells Fargo Center in Philadelphia. 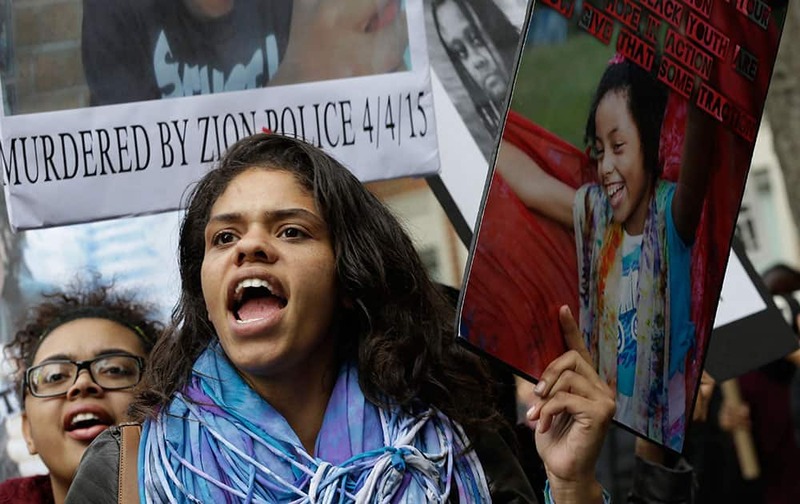 Demonstrators chant slogans during a rally to protest against police brutality in New York. Speakers at the protest said they want to bring justice for those who were killed by police.